The most Alpine region of the High Sierra…five of the peaks of the Palisade Glacier Region exceed 14,000 feet, and most of them are steep on all sides. R.J. Secor’s guide High Sierra Peaks – Passes – Trails notes that the Palisades were discovered and named in 1864 by the California Geological Survey, headed by Josiah Whitney. It is assumed that Frank Dusy was probably the first white man to see the Palisade Glacier, exploring from the San Joaquin Valley on the west side of the Palisades. As the first person to actually climb “North Pal”, Joseph N. LeConte’s description of his discovery is excitingly breathtaking! Definitely worth reading as a vicarious experience for boulder-hoppers such as myself! He wrote about it in the 1905 Sierra Club Bulletin, Vol.5, No. 1 – you can download your own copy thanks to Google, who has digitized them for us! 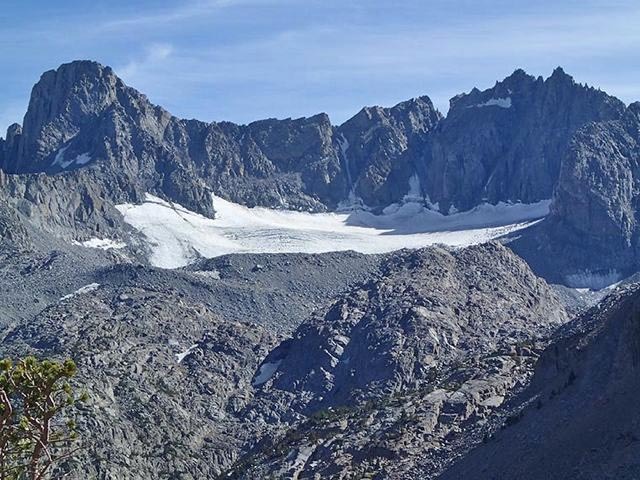 The North Palisade Glacier is the largest, southernmost Glacier in the Sierra Nevada range. It is almost one mile long, and 1/2 mile wide, and moves at 20 feet per year (although it is also retreating). It has a “bergschrund” or crevasse which can pose difficulties for climbers, a “moulin” formed during the 1977 drought (a hole through which surface water drains), and is noted for the “proglacial” lake that terminates at it’s base (damned by the moraine). Luckily you can view the Glacier and the Palisades comfortably from your campground at many of the lakes in the Big Pine Canyon. It is a remarkable and memorable experience to see this unique spot!